Clashes break out between the armed forces of Sudan and South Sudan, ahead of a meeting of the presidents of the two countries. Clashes broke out on Monday between the armed forces of Sudan and South Sudan in disputed border regions, according to a report in the Al-Arabiya network. The rare direct confrontation comes ahead of a meeting of the presidents of the two countries that was meant to ease tensions. Both countries have been at loggerheads over a series of sensitive issues since South Sudan declared independence from Sudan in July, taking with it most of the country’s known oil reserves, Al-Arabiya noted. 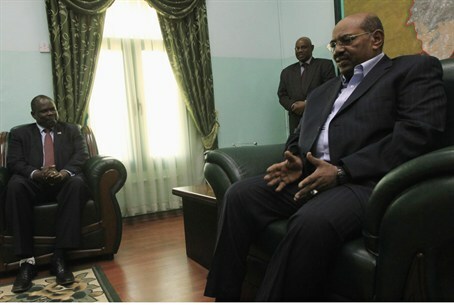 The two neighbors have yet to agree on the position of their 1,800 km shared border or how much the landlocked south should pay to export oil through Sudan. According to the report, South Sudan’s army, SPLA, said the Sudanese air force attacked the disputed areas of Jau and Pan Akuach Monday morning. The SPLA later repelled an attack by Sudanese ground forces in Teshwin inside South Sudan, SPLA spokesman Philip Aguer said. “After repulsing the attack, the SPLA pursued the withdrawing SAF (Sudanese Armed Forces) force and they captured two bases of SAF between Heglig and Teshwin,” he said. “There are casualties but we don’t have the full report... at the last communication, which is very difficult, there was still fighting,” Aguer said, adding the army did not want the clashes to spiral into war. “This was an act of self-defense on behalf of the SPLA, and we still commit ourselves to all the security agreements between us -- despite all this fighting we are committed to peace,” he emphasized. Sudan’s army spokesman Sawarmi Khalid Saad confirmed the fighting in the border area of Sudan's South Kordofan state and said rebels from Sudan’s Darfur region fought alongside the southern troops in South Kordofan. Darfur is the scene if a separate near decade-long insurgency against the Khartoum government. Each country has accused the other of supporting rebels on either side of the border but direct confrontations are rare, Al-Arabiya noted. The two sides clashed earlier this month. Sudan’s President Omar Hassan al-Bashir is due to meet his southern counterpart Salva Kiir on April 3 in the southern capital Juba to try to resolve their disputes, the report said. South Sudan shut down its oil production in January to protest Khartoum’s seizure of some crude. Sudan said it took the oil to make up for what it called unpaid transit fees.